The 351C in my Pantera is one of the few Fords I have ever owned. I do have a 65 Fastback with a 289 but other than that Ford motors are real foreign to me. My car came with numerous extra pieces when I purchased it this summer and I still am in the process of fixing her up and putting her back together. Last night I was planning on putting a polished Aluminum Water Pump on the 351C when I started comparing the old water pump to the new. I noticed that the new water pump does not have one water passage that the old one does. (I have included some pictures below). If I would bolt it up the new water pump will actually cover one passage on the block. Other than that they look the same with bolt patterns, etc. Is this normal for this style of water pump? I believe it was purchased through a major Pantera vendor but I’ll have dig around in the old owner’s receipts too verify it. Once again any information or advice is appreciated. 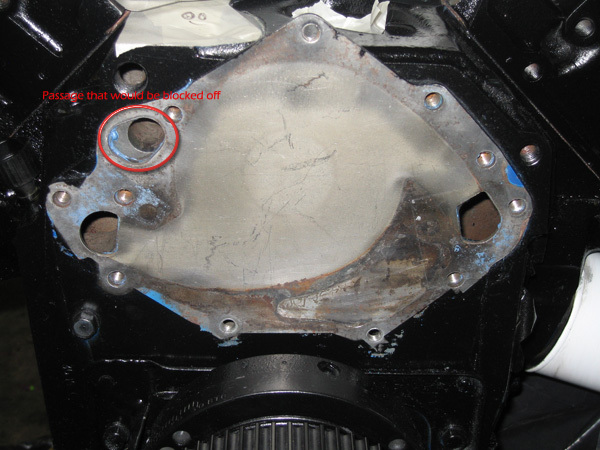 Here is a picture with the water pump removed. I have circled which passage would be blocked. 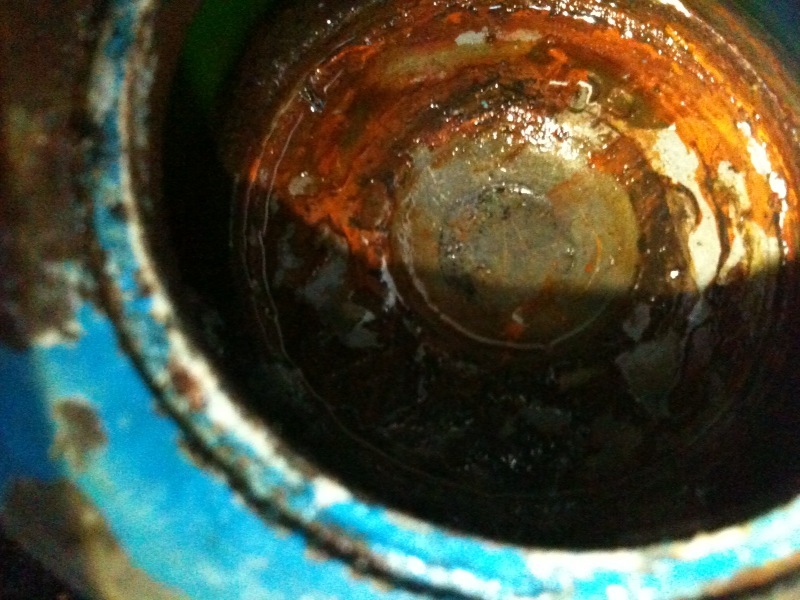 The old water pump has a port coming off this area but it had a threaded plug in it blocking it off. 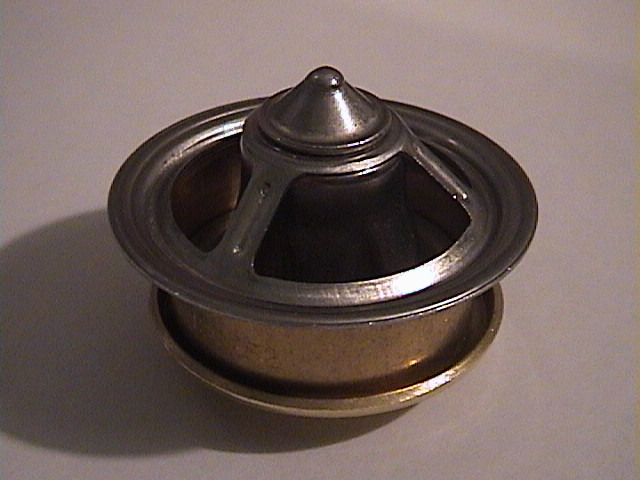 Most likely what you have is a Wieand aluminum water pump. They have been making this thing with the bypass blocked for years and insist that it is correct. The real answer is that it is not. You need to fix it by drilling a 1/2" hole in the location where the bypass is supposed to be. This is particularly important in the Pantera because of it's specific cooling design. There is an old thread on the subject here but it was a while ago. Perhaps Mr.Pence could help in finding it? He's really a wiz at that. Stock and some aftermarket 351-C water pumps have the port you show as an aid to faster warm-ups and less smog emissions. This goes along with the special 351-C thermostat that shuts off that port when it opens, by a thimble on the thermostat base that drops into the hole in the big brass washer just below it. If you don't care about fast warm-up (it actually only works for about 2 minutes), install the 'performance' aluminum pump. Then you can also use any old Ford thermostat rather than the special 192F degree 351-C unit. 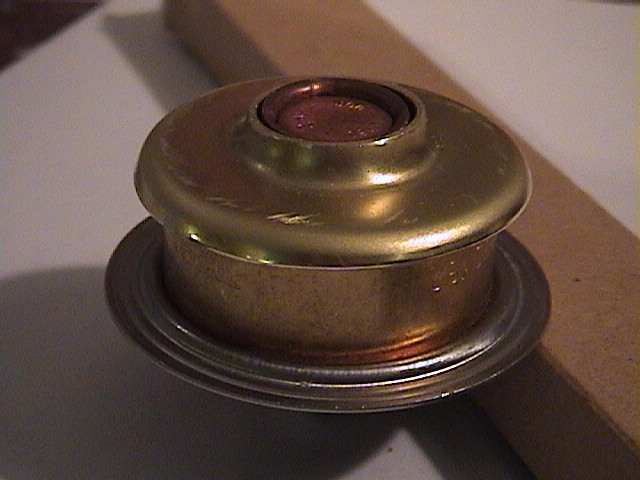 Some guys plug the brass washer's hole, or plug the stock water pump port, for the same effect. Note that using 'any-old' Ford thermostat with the bypass port still operational will bypass the radiator with an estimated 20% of the coolant, resulting in overheating. I have to add that while the aluminum pump saves wieght ... but thats about it with the WEIAND pump ... while the Elebrock pump has a cast vain impeller with and will truely pump more volume ... those pressed steel paddles are equal to stock. I bought 2511 with this Weiand unit installed. 36,000 miles later and no problems. Only issue with this design, as Bosswrench Jack noted, is slower warm-up. Mine was overheating after I installed the pump. Then we had the thread about it and I modified the pump with a bypass hole and it works fine now. The question with the Edelbrock pump is does the Pantera actually need more flow through the system. Sometimes more flow hurts. The fluid needs more time in the radiator to cool down. As Bosswrench says above, with the bypass blocked, I was getting less cooling. He says 20%. The Pantera radiator is fine for a stock engine but if you put horsepower into it, the engine will make more heat and then the radiator is not sufficient. I say use a pump with the factory style bypass hole in the pump. I am not doubting your experience, but I can see no reason why re-activating that warm-up feature would have any overall effect on the engine's normal-mode running temperature. With the correct thermostat the entire bypass circuit only comes into play for a few minutes on a cold engine. After that, the coolant warm-up will have fully opened the thermostat, causing the "hat" to block off the hole in the brass restrictor washer, and causing all coolant to flow in its normal manner. That is: pump, radiator, engine block, pump, etc. 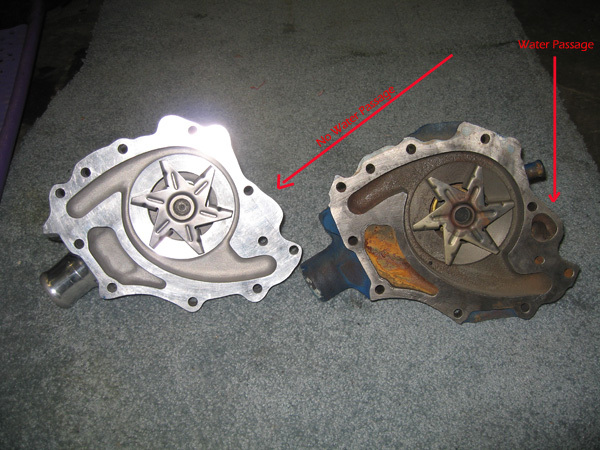 When you added the bypass hole to the water pump, did you perhaps also change the thermostat? Or perhaps remove an unknown cooling issue, such as an air pocket? No, that is not what he said. using 'any-old' Ford thermostat with the bypass port still operational will bypass the radiator with an estimated 20% of the coolant, resulting in overheating. To clarify, if you have not blocked off the brass restrictor washer, and if you have a stock-style water pump that still incorporates the bypass port (which is missing on the Weiand), and THEN use a non-Cleveland specific thermostat, you will not have the thermostat "hat" that blocks off the brass restrictor washer upon warm-up. With that washer not blocked-off by the "hat", an estimated 20% of the coolant leaving the water pump is instead free to just return (through that unblocked washer) into the block, leaving only 80% of the coolant to proceed to the radiator. It is important to note the Cleveland is unique in that its thermostat has that extra "hat" attached to its moving part. This is not found on any other Ford (or I believe ANY other anything) thermostat. That hat blocks off the brass restrictor washer. 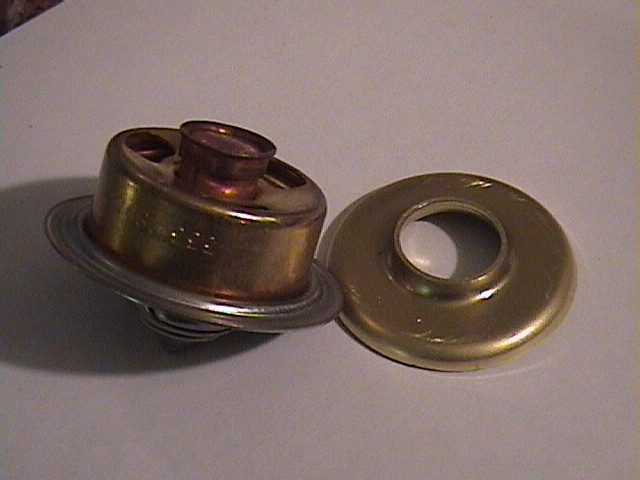 If your warm-up circuit (the water pump port and the brass washer) are still stock, you MUST USE the Cleveland specific thermostat that incorporates the "hat". 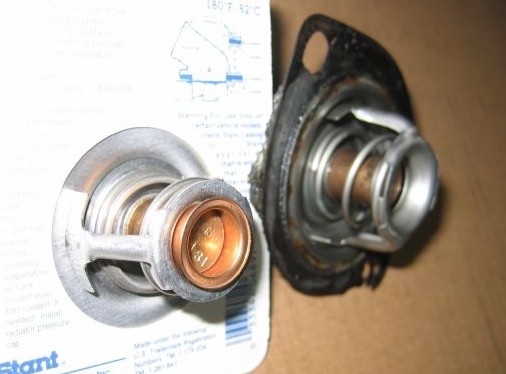 If you have blocked off the brass washer, OR use a water pump without the bypass port, you can then use ANY Ford thermostat; which gives you a greater selection of opening temperatures. 2511 has the Weiand with no port, the brass washer is fully blocked, and it has no cooling problems. The Weiand is Quella-modified with a (in theory) flow-increasing round steel plate riveted to the impellers and a Ron Davis triple-pass aluminum radiator. The rest of the system plumbing is stock. I run a non-Cleveland high-flow 180 degree thermostat. Which in turn opens another topic of whether normal running temperature is a factor of the thermostat opening design. In short, it is not. Your engine, when fully warm and at a steady running speed, will run at the same temp regardless of when the thermostat opens. Regardless of what he said, I was using the cleveland thermostat and the weiand pump and it was running really hot. I drilled the bypass and the car runs properly now. Thank you Professor for correcting me. Shall I do detention now? As I recall, the vane type rotor was being used in trans-am racing in order to reduce cavitation of the pump at very high rpm. The OD was also being reduced. Sounds right ... with a vained impeller the diameter plays a key roll in the gpm and head pressure. The missing passage is the recirc passage, a passage that comes into play only when the motor is warming up. Most motors are designed to constantly recirc coolant, even when warmed up, but not so with the Cleveland, it shuts off the recirc of coolant when it warms up. (1) drill out the missing passage full size & use the correct Robertshaw 351C thermostat, #333-180. I'm not able to measure things at the moment, I'm only relying on memory, I believe the passage is about 5/8" diameter. Don't drill it until a definite figure can be provided. There is an older thread about the passage in this pump, you may want to do a search and find it. (2) drill out the passage with a 1/4" drill & use a Windsor thermostat. Now your motor will constantly recirc a small amount of coolant, just like a Windsor. (3) leave the passage blocked entirely and use no thermostat. Not advised. Info for everyone, I was reading a 1972 Ford OHO publication recently and ran across a small article about the 351C water pumps I hadn't read in decades. It stated the stamped steel paddle blade style impeller actually flows more coolant than the Boss 302 curved vane impeller, but the paddle blade impeller begins to cavitate at 5000 rpm. Even when cavitating the paddle blade impeller continues to pump coolant, but the amount of horsepower required by the pump more than doubles when it starts cavitating. With the Boss 302 curved vane impeller installed in the 351C pump casting the pumping capacity was somewhat less, but cavitation didn't set in until 7000 rpm. With the OD of the curved vane impeller cut down (either 1/4" or 1/2", I forget) the pump could operate at over 9000 rpm without cavitation. Cutting down the impeller OD resulted in a decrease of pumping capacity however. I admit this is contrary to what I've recommended in the past, but it seems to me if your motor is seldom going to see over 5000 rpm then a stamped steel impeller is likely your best choice. If you want a motor that's ready for whatever you're going to throw at it, or if you want every part of the motor to compliment a 7000 rpm red-line, then the curved vane Edelbrock pump will be a better choice. Based on the SAE paper about the Ford GT cooling system, an automobile's cooling system should be capable of flowing about 100 gpm to allow the car to sustain speeds in the 200 MPH range. None of the usual pump choices flow this much coolant. If you want to drive full gonzo like that, contact Larry at Pantera Parts Connection about the stage 4 Stewart pump he sells for the 351C (its actually a modified Windsor pump), its rated up to 160 gpm. Maybe I;m reading this wrong ?
" all new DRV-series 8 vane CNC machined 6061-T6 billet aluminum impellers. Developed by Stewart Components, these impellers flow up to 41% more water at twice the pressure than traditional designs... while consuming less horsepower." " stamped steel paddle blade style impeller actually flows more coolant than the curved vane impeller" ? Leave the Weiand as supplied (no bypass port drilled) and use Cleveland or general Ford thermostats. Also, my engine port is totally blocked off. Did you just omit that choice inadvertently, or is there a reason you do not endorse it? You see that in a 37 year-old Ford publication. That statement was valid for the then available versions of this pump. That was not referring to the entirely different, newly available Stewart pump. Here are two past posts on the subject. I disagree Prof.Larry. Both of those impeller designs are still being used in current production pumps. Therefore the results will very likely still be the same I would suspect. And as far as speed up the circulation through the radiator, that depends on which radiator you have. If you have the stock radiator faster flow through it isn't necessarily a good thing. It could get your hot water back to the engine quicker...true. If you have a revised design that partitions the circulation through the radiator then it might help. Of course coulda, shoulda, woulda, isn't very scientific. Any scientist worth his own salt will post supporting data. I'll reserve my judgement until I see it. My reaction to the horsepower drain is simple. To go from 3 hp at below 5,000 to 6 hp above 5,000 really isn't a big deal to me. Those 200mph runs down to the 711 to pick up a Mega Millions before it's too late have kinda gotta stop for me anyway. Of course I have to wait for the CBO to return a report on their analysis of the subject. Then we can debate on whether or not illegal aliens will or will not benefit from the change. Of course that all depends on what the meaning of the word is, is. 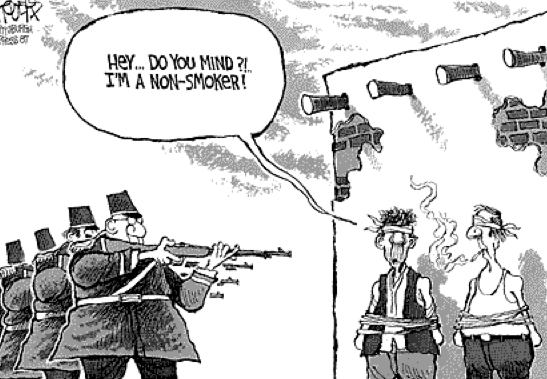 Are you guys sure that you aren't US Senators? H. Didandeh, C. Toksoy, F. Cutler, A. Ecer, Technalysis, Inc.
Design of an automotive water pump requires selection of an impeller geometry which can be constructed of stamped metal or molded plastic. Generally, the cost of the impeller itself is not of major importance and its efficiency is not optimized in detail. 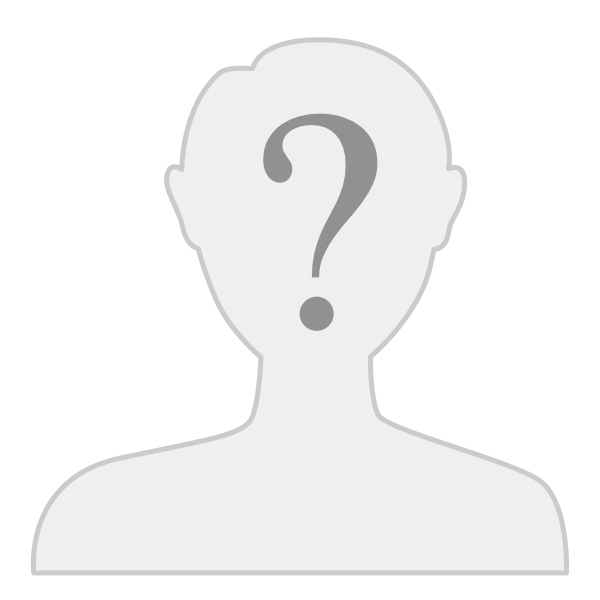 The major concern has been the ability to deliver the desired flow rate. Therefore, most of the present automotive water pump impeller designs tend to be rather inefficient yet easy to manufacture. In the present study, an existing impeller was replaced by a new design which can deliver the same flow rate with considerably higher efficiency. The improvement is significant in terms of the overall efficiency of the engine. The plastic impeller contains efficiently designed curved blades which results in improved performance. The open face side of the stock water pump impeller, however, allows the pumped engine coolant to `spill` over the open back of the blade during operation through the open spaces between each of the impeller blades, spoiling the ability of each blade to fully trap and pump all the water that is in front of it. This spillage also creates cavitation, decreasing pumping efficiency and requiring that more power be used to rotate the pump than would be required if the cavitation was not present. The addition of the anticavitation disk to the stock impeller eliminates the cavitation caused by coolant spilling out the open face of the stock impeller by blocking off the open spaces between the blades. In other words the vaned impeller is better. No argument but where are the numbers? Where also are the calorie disappation rates of the radiator, or more correctly the cooling system since in this instance the pipes to and from the radiator are also part of the equation? In fact, adding surface area to those tubes will add to the ability of the entire system to dissipate heat, effectively adding capacity to that system. The differences between the two impellers was documented by the Ford Trans-am racing team in 1969. 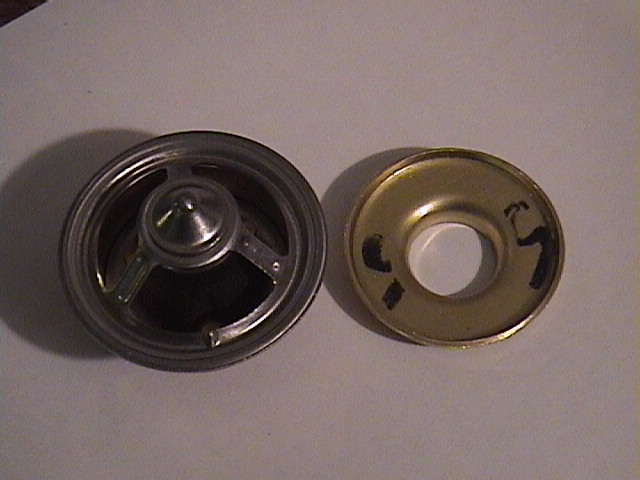 The two impeller designs available remain to this day essentially unchanged. Given the choice of the two I would select the vaned impeller design but the difference really is virtually negligible to all but a dedicated race car. Panteras with the inferior paddle design regularly run in open track events and show no significant differences with others in performance. I didnt post the entire articles because they were lengthy. The theory is that the COST difference is the reason there are so many PADDLE STYLE water pumps in automotives. A vaned impeller cost significantly more to produce .. while a street car would never see the benefit of this design. A vaned impeller was used to cure the TRANS AM high rpm cavatation problem ... but cavatation is taking place all the way thru the rpm range with the open style paddle impeller including idle. No numbers are specifically posted on the difference ... but there are a host of manufacturers including FORD SVO that label there pump a high volume and wa la underneath is a vaned impeller. I guess the humor in all this is its like comparing a MISSISSIPPI Paddle River Boat to a Florida Cigarette jet boat ... both push water and get to the other side ? I would take an educated guess and say that there is no equipment that is 100% efficient and there probably never will be. I'm sure that one doesn't need to be an actuary to show the difference in efficiency between these two impeller designs that one is more efficient then the other. The vaned rotor is the most efficient until something else comes along. Like I said, given the choice I'd pick it over the paddle but I don't think that if I am running the paddle design that I am in serious jeopardy of any eminent disasters. But I'd run a pump with the bypass hole and the Cleveland thermostat. A 180. Which is what the thread was before it got sidetracked. ...ok. I'm guilty. So shoot me. But I'd run a pump with the bypass hole and the Cleveland thermostat. A 180. Which is what the thread was before it got sidetracked. If the recirc passage is blocked and there is a thermostat in operation, then when the motor is cold & the thermostat is closed there shall be no circulation of coolant. The result is the heads are thermally shocked over and over each time the car is cold started. Doesn't your temp gage reading pulsate as the motor warms up? Some guys have gotten around this by drilling holes in the thermostat disk, allowing some recirc through the thermostat. Another method to avoid this would be to open the heater control valve before cold starting the car, coolant would thereby recirc through the heater core. With the availability of the correct thermostat from Robertshaw there is no reason to botch up the advanced design of the 351C cooling system. So my preferred recommendation would always be to drill out the recirc passage and use the 351C specific Robertshaw thermostat. And so it is said and so shall it be done Senators. Block progress as you will, and insist that day is night. There are none so blind as he who will not see. "Happy Christmas to all, and to all a good-night! Yes, that has been done. Where Q is the heat load BTU/min., M is the mass flow rate of the coolant in BTU per pound per degree F, dT is the temperature drop through the radiator in degrees F. Thus if M the mass flow increases the dT (temperature drop) is larger. What may happen in practice to cause poor cooling is the pump starts cavitating. More so in a Pantera where a) the tube under the car feeding the pump is smaller diameter than the pump inlet and b) has a 90 degree bend not far from the pump inlet. In a well designed system high radius bends and tubing of equal size would be used. The radiator design is the largest restriction to going to very high coolant flows and it is suggested 6-8 ft/sec is optimal (do not exceed 10ft/sec)in a cooling system. Too high a velocity can result in aeration and foaming of the coolant, possible damage to the radiator by overpressure, cavitation of the pump due to excessive pressure drop through the radiator, and erosion of the radiator tubes. Reduce pump speed - actually not so dumb, get one of those 30% higher volume pumps and use an underdrive pulley to slow it down 30% and your are back to stock volume with a pump running slower and less likely to cavitate. FWIW some paddle style aftermarket pumps do have a backing plate on the paddles which helps reduce cavitation. Switch to an aftermarket electric pump which has far less tendency to cavitate. Increase suction pressure (reduce suction head) - Add a booster pump i.e. a remote electric pump after the radiator. Bear in mind the above 10ft/sec rule. For my stroker that is half block filled I will go all electric or add the booster pump, probably the latter in my sitution and look at larger tubing. Two things occur to me on this subject. 1)I presume that the vaned impeller design flows more g/min then the paddle design? 2)I presume that the increased flow of the vaned impeller is below the maximum flow rate of the stock radiator and system, and therefore is usable by the system? I personally have never found a way to put 10 pounds of mud into a 5 pound sugar sack? Maybe someone here has? 3 Ofcourse this Thermostat is in the CLOSED position. 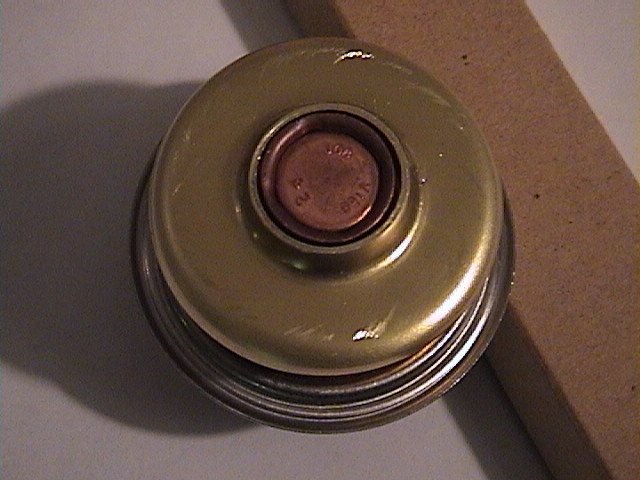 When OPEN the Lower 'Can' will 'Seat' (or nearly seat)upon the Restrictor Plate as shown. 5 Stay with the 180 Degrees! 160 is too cold and the only reason You would need a 192 is if You were running Catylitic Converters OR You wanted a Hotter Running Engine to Produce More HorsePower! Merry Christmas!! Nice to see both pieces in relation to each other. Thanks, and hope you had a Merry Christmas. I've never had cooling issues since I built my stroker 10 years ago. My temp gauge rises smoothly as it warms up. The temp then stays consistent at around 170 / 180. A little higher in hard driving or traffic. Lately its been suddenly rising from 180 to 210 over a minute or so and then falls back to 180 just as quickly. This will happen a few times during highway cruising with no change in speed or conditions to cause this. I assumed the thermostat was sticking so I got a replacement. I got the 330-180 and when I was getting ready to replace it this is what I found inside. Isn't there supposed to be an opening in the center of this ring that the t-stat plugs as it opens / closes? What you have is a block off plate which is used when you don't use the 351C specific thermostat that has the "hat" which seals the hole in the restrictor plate located under the thermostat. The restrictor plate with no hole in it forces all the water out of the block all the time, instead of allowing the water in the block to warm up the engine quicker. The restrictor plate you have allows for the use of any thermostat that doesn't have the "hat" on the bottom. The restrictor plate I use in my car does have a very small hole in it simply to allow for air to eascape the block when filling it up with anitfreeze but otherwise it is identical. Being that I live in the desert and it gets very hot, I run a 160 degree thermostat in mine.